The railroad crossing at Livingston Street has been marked for closure since 2012 but has now been spared along with Brearly Street. 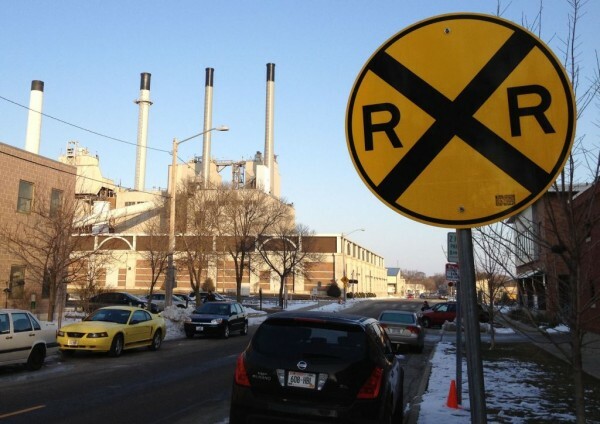 The saga of the fate of several railroad crossings on Madison’s isthmus may be over, for now. In an order signed today (March 26) by the Wisconsin Commissioner of Railroads (OCR), a petition to close rail crossings at Livingston, Blount, and Brearly Streets by Wisconsin & Southern Railroad Company (WSOR) was dismissed after a legal battle with the City of Madison had stagnated along with changing conditions adjacent to the tracks. 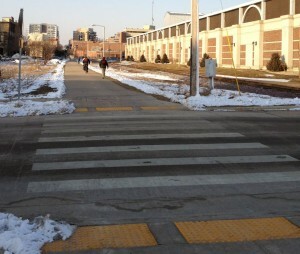 In dismissing the petition, Wisconsin Commissioner of Railroads Yash P. Wadhwa cited active development at the Livingston Street crossing as well as outdated evidence that supported the original petition as a reason to end the current legal process and invite all involved to keep working together voluntarily to improve the corridor. District 6 Alder Marsha Rummel who has been actively pursuing this issue says new development in the Capital East corridor has changed the calculus since the initial petition. “Livingston is now an important connector street between Williamson Street and the new Festival Foods grocery store on the north side of East Washington Avenue. The circulation of these streets are important for public safety and continued economic development,” Rummel said in an email to WSB. “I am concerned that closing streets could create more trespassing, especially at Livingston. I would like to work with the railroad to create more Quiet Zones and invest in equipment. The City with its dense network of streets along downtown corridors can be managed safely without creating dead ends and cul de sacs. The heavily traveled Capital City Bike Trail is only 25 feet from the rail bed but was never considered to be affected by any closure of Livingston Street. In 2009 WSOR had petitioned the OCR to close railroad crossings at Blount, Livingston and Brearly streets citing safety, the numerous crossings in a compressed distance of 1.06 miles, increased shipments of frac sand and grain necessitating longer trains (up to 1.75 miles), and an anticipated increase in train frequency to 12 to 15 trains a day. Action on the petition was postponed several times including in 2010 when it was proposed that the location of now cancelled Milwaukee-Madison high-speed rail station move to Monona Terrace. A hearing was held in early 2012 on the matter and later in July of that year a hearing examiner proposed closing the Livingston Street crossing but leaving open Blount and Brearly Streets. The City of Madison Madison Gas & Electric, state and local legislators as well as neighborhood residents opposed the Livingston closure but supported the other findings by the hearing examiner. The Commissioner of Railroads at the time, Jeffery T. Plale agreed with the hearing examiner’s recommendations except he also ordered Brearly Street closed. The City appealed the decision in court and almost a year later, Dane County Circuit Judge Maryann Sumi ruled that Plale applied the wrong standard of “public safety and convenience” in his decision even though there was no dispute that all crossings in their current form and use were safe. At the time City of Madison Attorney Steven Brist said that Sumi had ruled that Plale didn’t adequately explain why two crossings had to be closed. The city asked Sumi to reinstate the original proposed decision but she ruled the Court lacked authority and the decision was referred back to the OCR to use the correct standard. In late 2016 the OCR issued a Proposed Second Final Decision which granted closure of the Livingston Street crossing but kept open Brearly and Blount streets. Part of the consideration was that average traffic counts at the crossings increased over the rates used in the original petition. Blount Street effectively eliminated itself after its average traffic counts exceeded the 2,000 per day screening threshold, mostly due to MG&E employee traffic. Traffic crossing at Brearly Street also increased to 1250 per day but Livingston actually decreased. Also weighing heavily on the decision was the the need to keep access to all areas of Central Park by emergency vehicles now that the area was seeing a large increase in use. In an emergency, while responders can access the middle of the park from either direction along Ingersoll Street, the west side of the park would only be accessible from Brearly Street north of the tracks if the crossing is closed. Evacuating people out of the west side of the park should be in the opposite direction to arriving responders, or south along Brearly Street and across the tracks to safety. But if the crossing is closed, there could be opposing flows of emergency responders and evacuees impacting each other’s movement.33 Two simultaneous opposing flows can exist but Brearly Street may not offer the capability to accommodate such flows. Because of the many unanswered questions, closing the Brearly Street crossing may not promote public safety. Since the issuance of the Second Final Decision, the OCR has been receiving public comments including those who oppose the proposal to close Livingston Street. Many cite both planned and current developments underway near that crossing as a reason to keep it open which weighed heavily on OCR’s reasoning in dismissing the petition. The ruling by the OCR states that WSOR may start the process over but invites all parties to work together voluntarily to increase safety along the rail corridor. This entry was posted in Madison, Willy Street by TheEastSider. Bookmark the permalink.